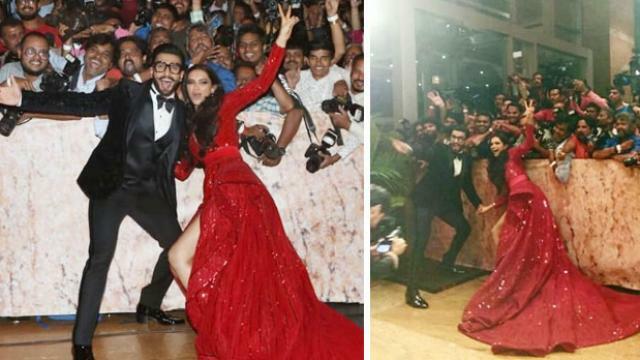 The last reception of Deepika Padukone and Ranveer Singh (Deepika Padukone-Ranveer singh) will be remembered for a long time. Because this reception includes almost complete Bollywood. Apart from this, Deepika-Ranveer's look in this spectacular party was also in great discussion. But what will be remembered for a long time Deepika and Ranveer's generosity are those. Yes, both of the videos before the reception begins are becoming viral. In which both of them met the media person and photographers present there and clicked selfies with everyone. Seeing these Kindness of the two, all the people present there were extremely impressed. Well this is not the first time. When Deepika-Ranvir won the hearts of media people. Before this, both have won the hearts of people with their Sense of Humor on many occasions. Ranvir is called as Cameramens Baba and after marriage, everyone has started saying Deepika to sister-in-law. However, Deepika-Ranvir Hot Couple came out in the reception. Their hot chemistry and stunning appeal won the hearts of everyone. Both reception photos and videos are becoming increasingly viral. Please tell that Deepika chose a red shirt for this reception. With whom he pursued a no-go-look look. Only Manglasutra in the neck and the nakedness of marriage was seen in the hands. Apart from this, Deepika was looking very gorgeous in open hair. Ranvir is seen in the black suit and the black blazer here. He was wearing a bow and looked at specs. They looked very cool.